Members of the Massachusetts Communities Action Network, a statewide faith-based community organizing group, demonstrated for changes to sentencing laws during the news conference announcing the recidivism proposals. Top Massachusetts officials from the executive, legislative, and judicial branches unveiled a plan Tuesday aimed at reducing the number of prisoners who are released and then return to jail or prison. But the bipartisan package, a version of which is likely to become law, turned up the heat on a long-simmering debate over where to draw the line between protecting public safety and helping fewer people end up behind bars. Although Massachusetts has one of the lowest incarceration rates of any state, officials agree that the state’s high recidivism rate is a problem. Two-thirds of people leaving jails here and more than half of those leaving state prison ended up back in the criminal system within three years, the report said. The officials agree that the system should be reformed. But they disagree over how big the changes should be. State Senator Sonia Chang-Diaz castigated leaders for dragging their feet in fixing the criminal justice system. The new bill represents some common ground. If the legislation becomes law, many prisoners will have a greater opportunity to earn early release through participating in and completing rehabilitative programming. That, in turn, will incentivize taking part and finishing programs such as those that try to change the way criminals think about their behavior. “The best predictor of whether somebody is going to commit a crime is whether they think committing a crime is OK,” said Senator William N. Brownsberger, who highlighted the importance of programs to change criminal mind-sets. In theory, some criminals sentenced to, say, a thousand days in prison could earn up to 350 days off their sentences under the bill. But a more likely reduction based on program participation and completion might be 25 percent of a person’s sentence, said Brownsberger, a cochairman of the Legislature’s judiciary committee. Liberal advocates say the legislation — and a data-driven companion report from an outside nonprofit, the Council of State Governments — is woefully insufficient to address “mass incarceration” in Massachusetts, or even the narrower problem of people released from the criminal system who end up back in it. 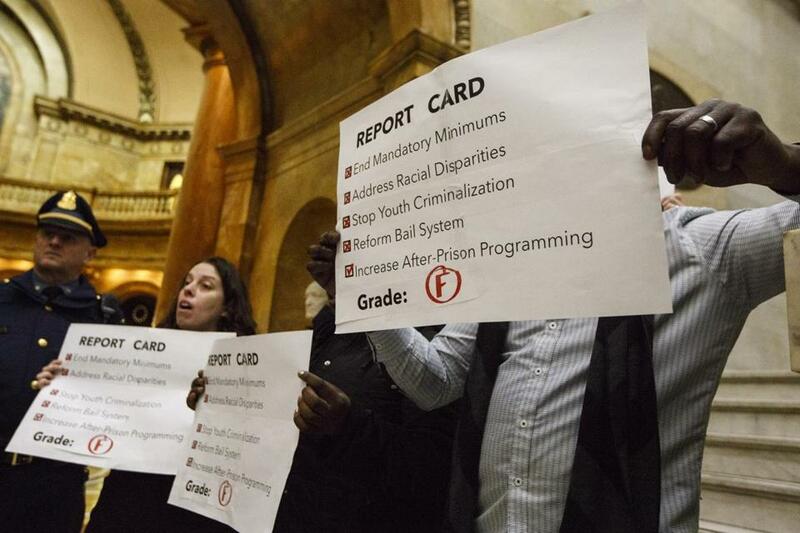 Lewis Finfer, the director of the Massachusetts Communities Action Network, a statewide faith-based community organizing group, said meaningful reform must include changes to sentencing, such as ending mandatory minimum sentences for drug crimes. Finfer said the state can’t solve the high rate of recidivism without addressing sentencing. Protestors affiliated with Finfer’s group repeatedly interrupted the news conference. There is a political reality, however. While Senate President Stanley C. Rosenberg backs ending mandatory minimum sentences for drug crimes, Baker, House Speaker Robert A. DeLeo, and the state’s district attorneys are, in varying degrees, more reluctant to make broad changes. DeLeo’s chamber is more conservative than the Senate. And Baker, a Swampscott Republican who is expected to seek reelection in 2018, could face a primary challenger from his right. “I see this as a step in the right direction,” Rosenberg said at the news conference. The Amherst Democrat added he expects a robust debate in the months to come over balancing public safety with making sure that the state is only incarcerating people who need to be incarcerated. The report from the outside nonprofit, commissioned by state leaders, offered several possible policy proposals: increasing participation in programs proven to reduce recidivism; shortening the time between when prisoners are approved for parole and when they actually leave incarceration; strengthening supervision of people who have been let out of prison and jail; and increasing access to mental health and substance abuse treatment after prisoners are released. Some were incorporated into the bill. Cape and Islands District Attorney Michael O’Keefe, who was a member of the working group that helped craft the report and represented his fellow prosecutors, lauded the effort. “There are many things in there that the district attorneys are going to be able to get behind and support, particularly those things around recidivism,” said O’Keefe. But on the touchstone issue of nixing some mandatory minimums, he pointed to the state’s low incarceration rate. In 2015, Massachusetts had the second-lowest imprisonment rate of any state, with 179 sentenced prisoners for every 100,000 people of any age, according to the federal Bureau of Justice Statistics. Nationally, 458 prisoners were sentenced to more than one year in state or federal prison per 100,000 US residents. Chief Justice Ralph D. Gants of the Supreme Judicial Court said at the news conference that the report and the companion legislation were just the beginning of the state’s efforts this legislative session to grapple with ways to make the justice system more fair and equitable.